Locate the intersection between Hwy. E-6 and Hwy. 70 in Oppdal. Oppdal is a skiing village located about 100 kilometer south of Trondheim. Measure from this intersection. Take Hwy. 70 west towards Sunndalsøra. Drive 20.9 kilometer to Lønset, turn right, then right again after only 200 more meter. Continue until kilometer 35.7. There should be a small parking area on your left side, just next to a building. This is the trailhead, park here at location N62.67021, E009.19697, elevation about 587 meter. Note that this mountain is called Kråkvasstinden or Sandåhøa, depending on who you ask. This is fairly common in Norway, that a mountain is named differently by the locals living on opposite sides (in different valleys) separated by the mountain. From the parking, cross the lake Ångardsvatnet going slightly right in order to enter the flat area on the opposite shore from its right side as viewed when crossing. In winter, there may be a ski track that you can follow. On the far side, the uphill trail/route starts at location N62.66501, E009.18100, elevation about 600 meter. Follow the broad ridge uphill. 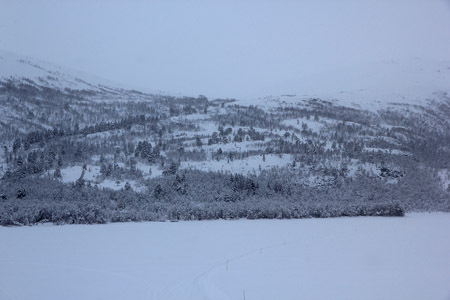 As vegetation becomes more sparse, the route bends left and enters the small valley where the creek Sandåa runs. Continue uphill until you reach about 1000 meter of elevation, cross more left and leave the creek. Ascend the slope to lake 1294, then continue uphill to lake 1446. From lake 1446, ski east towards the saddle and turn right as you ascend the east ridge. This ridge is a bit narrow further up, but quickly widens. Continue up the ridge to the summit. Stay a bit left if the visibility is poor as there is quite a steep cliff on your right. I arrived at Trondheim airport around 1900 and picked up a rental car, then drove to the DNT self-serve hut Bårdsgarden, located a few kilometer further up the road from the trailhead. This hut is really a very large and nice house, having a standard well beyond a normal self-serve hut. Livingroom, kitchen and dining area, many bedrooms upstairs etc. Not surprisingly, several people had decided to use it as their "base camp" for the winter break. I got up quite early the next morning and drove a few kilometer back to the trailhead near the farm named Ångarden. Leaving at 0730, I followed a well groomed track across the lake. As it entered the vegetation and started uphill, I thought that this trip would be quite easy. I had not anticipated a marked trail to this summit. The entire way up among the trees, I saw red poles indicating the route. However, as soon as I came out above the treeline, no more markers. This seemed rather strange as one could hardly loose the track further down, much more easily up here in white-out conditions. I continued to follow the marked route since the alternative was to break trail in pretty deep snow. Unfortunately, this track turned more west into the valley south of Lorthøa (1346m). I turned sharply left and made my own track up towards lake 1294. Proceeding to lake 1446, I skied into the clouds and lost almost all visibility. 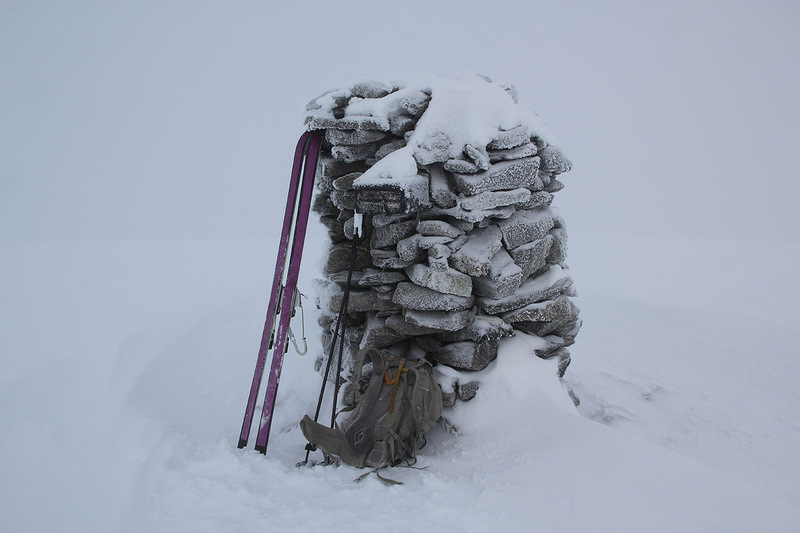 A rather careful continuation up the first part of the east ridge, then more easily to the summit cairn, arriving there at 1145. I signed the summit register and started my descent at 1200. The skiing was easy and I reached my car at 1330. The next priority would be to meet my friend Jostein, we had a very nice ski climb of Blåøret the following day.